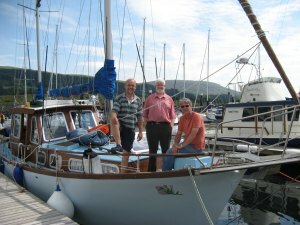 In spring 2008 Alan announced that he was intending to do a circumnavigation of the UK. He wanted crew for the first half of the journey. For the remainder he planned to solo sail down to Wales via the Isle of Man, then head across to southern Ireland for an explore. Then, all being well, he would head across to the mainland south coast, possibly taking in the Scilly Isles that we had failed to reach in 2007, before hugging the coast back to Tollesbury saltings. Alan is undeniably the most adventurous of the Tollesbury Mud Club, that band of happy souls who moor on the Tollesbury saltings. He asked Rex Davenport and myself to crew the first leg, Rex being an experienced sailor. Both Rex and Alan had work obligations to attend to. Rex needed to get back to work by 2nd June. Alan could do most of his work from the boat (which he often did), but also needed to get back to meet a customer. So we agreed that we would aim to get to Largs marina on the Clyde estuary in order to catch a train back to the homeland on 31st May, leaving the boat moored in the marina for a week or so. Work commitments also fixed our cast off date to 22nd May on the 01:00 tide. 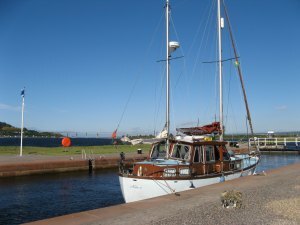 This was a pretty tight schedule, and we weighed up the relative merits of sailing around the top end of Scotland, or sailing down the Caledonian Canal. Our thoughts were that the canal would be quicker, and since time was of the essence, this was favourite. 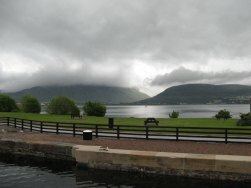 As it turned out, we had not anticipated that the locks within the canal system only operated during working hours, forcing us to spend a night half way along the Great Glen. Another deciding factor was the knowledge that along the top end of Scotland there were no places to shelter in, and if a storm cropped up it would have to be ridden out. Thus, we opted for the canal route. On a bright, sunny morning, after the long leg up the east coast, we observed the gas pipeline survey vessels at work off Peterborough, before veering west into the Moray Firth . With land visible to break up the monotonous seascape, the voyage could only get better. Don't get me wrong, seascapes can be beautiful at times, but three and a half days of choppy, grey North Sea can wear a bit thin. It was apparent we wouldn't reach Inverness by nightfall, so we put into Lossiemouth. Terra firma felt good again, and after a welcome shower, we celebrated with a couple of beers in the local pub that evening. The following day, we had a few hours to kill until there was sufficient water over the harbour sill, so we made a few repairs to the captain's chair, then Rex and I had a delightful exploration of the town for provisions. Lossiemouth is a small, quiet out of the way town, but we were informed it was only quiet because of the Bank Holiday; normally there would be air force jets screaming overhead. Being in Scotland, I thought a haggis would be a "must buy". Rex happily agreed and we found a good butcher who could oblige. Once we had a good depth of water, we paid our fees to the cheery Harbour Master, slipped out of Lossiemouth and set course for Inverness. On the way we caught sight of the Cromarty Firth with snow-capped mountains in the distance and now I felt we were in Scotland properly. This was an excellent leg with much whale spotting, marred only by having to take the floor up in order to tighten the engine alternator belt; one of Kiitaja's little quirks. As we headed down the Beauly Firth we passed Fort George guarding the entrance to the Great Glen. The north eastern end of the canal is the sea lock at Clachnaharry, a lovely name. We could get through the sea lock, but couldn't proceed any further since the inner canal locks were only operated during working hours. A young woman from Gloucester was the sea lock-keeper, and she pointed out that good food could be had at a nearby pub. This gave us an excuse to further stretch our feet and sample the local cuisine and beer. Having travelled all this distance from Suffolk, I was astounded to find that the pub was also selling Adnams and Green King, my local Suffolk ales. Slicing through the Great Glen, this majestic canal is considered by many as one of the greatest waterways of the world. 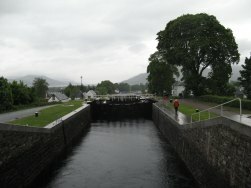 The canal runs 62 miles across Scotland, linking Fort William with Inverness. Only one third of the entire length is man-made, the rest being formed by Loch Dochfour, Loch Ness, Loch Oich, and Loch Lochy. These lochs are part of the Great Glen, a geological fault in the Earth's crust. 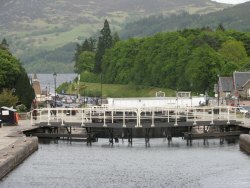 There are 29 locks (including eight at Neptune's Staircase, Banavie), four aqueducts and 10 bridges in the course of the canal. The canal was started in 1803 to plans produced by Thomas Telford following survey work by James Watt thirty years earlier. It was the biggest of the building schemes undertaken by the Government to provide work and stem the flood of emigration from the Highlands. It has survived in part due to its continuing importance in the Highland economy, and partly because it is quite simply spectacular, not to mention the amazing wildlife - including the Loch Ness Monster. Hmmm.... we didn't spot him. Loch Ness is soon reached from Clachnaharry. It and its surroundings can best be described as beautiful, serene, majestic, rugged, romantic and smothered in history. There weren't many vessels about, and we had a glorious journey down its 22 mile length, partially under sail, partially under engine power, to Fort Augustus at its southern end. A highlight of the trip was a lunch of haggis, neaps and tatties; a first for Kiitaja. Rex and I alternated cooking duties, with Alan occasionally turning his hand though he would be the first to admit he is not a natural. Fort Augustus was originally named after St Cummein, who built a church here: being known in Gaelic as Cille Chumein. The current name was an imposition that accompanied the building of a fort, Fort Augustus, after the defeat of the 1715 Jacobite uprising. The fort, and so in turn the village, was named after King George II's younger son, Prince William Augustus. Today, almost nothing remains of the original fort, parts of which were incorporated into the Benedictine Abbey when it was built in 1876. The community of monks was unable to sustain itself and left in 1998. We had to break our journey here because of the flight of locks we would have to climb. This would not be until morning when the lock-keepers resumed their duties. With such lovely settings, who could complain. An excellent chance to take a shower and cook food on a steady deck. A flotilla of canoes landed near us. The canoeists were air force lads and lasses out on an exercise. They had just paddled down Loch Ness, and were carrying their canoes past the locks in order to carry on down the canal. We passed them the next morning as they were dismantling their tents further along the canal banks. At the entry/exit points of the lochs along the canal small lighthouses can be found, known as beehive lighthouses, as shown in the picture. When it comes to getting craft through the locks, the procedure is for crew to get out and man-handle the vessels via ropes; one pulling forward, the other slowing the vessel down. This kept me and Rex amused for a while, though I did manage to screw up at one point. Rex had pulled Kiitaja forward, and it was my turn to slow her down. I was rather fierce in my slowing down technique, and completely ripped out a fairlead on the stern, which duly sunk to the bottom of the lock. Alan was quite forgiving, but he must have had a quiet curse too. One of the lock-keepers spotted this, and explained to me the art of slowing boats down without wrecking them. We continued the wee chat and he asked me what the orange contraption on board was. This contraption was a parbuckle, basically a homemade flexible structure that Alan had made for rescuing unconscious folk in the water. The basic idea is to get alongside a body dragging the structure underneath them, then haul the structure and body aboard. There were inherent problems with this regarding rigging fouling the process, and fortunately we have never had to use it in earnest. He expressed in a mixed amused and dour way (if you can imagine that) that this would be futile. By the time such an operation was implemented, the poor soul would almost certainly be devoid of life. He carefully explained to me that he had long been involved in survival techniques, and discussed an exercise where Duncan Goodhew had been immersed in water at 10 deg. C to see how long he could survive before becoming impaired. After 10 minutes Duncan was incapacitated and hallucinating. Now he is a fit fellow, so the great unfit amongst us would only survive for a shorter time. Indeed the lock-keeper pointed out that the Loch water at the time of year we were sailing was only 6 deg. C. There is a moral there. Loch Oich and then Loch Lochy slipped by, the gloomy mists shrouding the historic bloodbaths draped on these shores. We enjoyed a meal of Scottish Loch trout passing down these lochs, which is rather ironic since I had bought the Scottish trout down in Suffolk! Gliding along these lochs gave me and Rex time to have union meetings. Rex is an endless source of humorous banter; I always enjoy his company, and he has a sympathetic ear to boot. Approaching the south western end of the canal are the magnificent Neptune's Staircase locks. We were the only vessel passing through, and we got down those locks in record time; perhaps the lock-keeper was anxious to get out of the drizzle. To the south of us stood Ben Nevis capped in cloud. A short distance further on, near Fort William, is the Corpach sea lock. Once released from the restrictions of the locks, we headed down Loch Linnhe through the Corran Narrows leaving the mists of the glens behind. Night descended and Alan took the night watch. He woke Rex and I up in the middle of the night just outside Crinan sea lock. The lock wouldn't open until 08:30 so we hunted around for a buoy to tie up to and went back to our bunks. He mentioned that on the way down he had encountered fiendish currents between the islands. 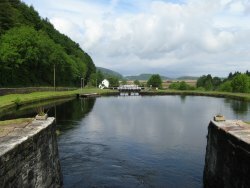 The Crinan Canal starts at Crinan on the Sound of Jura, and ends nine miles away at Lochgilphead on Loch Fyne. It was designed to provide a quick link between the west coast and islands at one end and the Clyde Estuary at the other, and so avoid the long voyage around the south end of the Kintyre Peninsula. There are 15 locks and the canal reaches a height of 65 feet above sea level. The summit reach of the canal is less than a mile long, with locks at Dunardry marking the end of the reach. Every time a boat goes through the locks about 300,000 litres of water are used. The sea lock-keeper at Crinan was also a young woman, this one hailing from near Preston. I pondered for a while on what a laid back enjoyable job that would be, and if I were ever to return to the world of work, this would be ideal, though I should imagine there is a long waiting list and the job is lowly paid. The canal itself is in an idyllic part of Argyll and Bute, with gentle, tranquil, breathtaking and lush landscape as opposed to the rugged surroundings of the Caledonian Canal. A beautiful sunny day made this canal voyage even more exhilarating. One aspect of negotiating the canal that appealed to me was that the locks had to be operated manually by ships' crews; I found this a most enjoyable exercise. It was made easier for us by having another boat pass through at the same time as us, thereby one crew could be opening the next lock gate whilst the other would be closing one behind, effectively doubling our speed through the locks. This was fairly important since the sea lock at Lochgilphead would be closing at the end of the working day. Once through this delightful canal we passed down past Loch Fyne to the Sound of Bute. Steering between Bute and Arran, we headed north east between Large and Little Cumbrae Islands to Largs, our final port of call of this first leg. Here Rex was convinced that he had spotted another whale. Alan was hoping to spot a submarine cruising down the Clyde estuary (he did eventually). Largs, a small resort, has a huge marina capable of holding 600 boats. 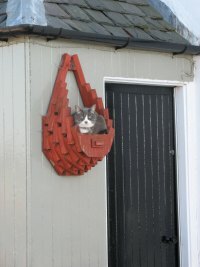 It is ideally suited as a base for exploring many of the Western Isles. Indeed we met a crew who hail from Lancashire and keep their boat moored there to take advantage of the good sailing to be had amongst these isles, and I'm certain many more do too. There again there are folks from Yorkshire and Kent who keep their craft down at Tollesbury saltings. I tried to recall a past memory of Largs. When I was at primary school, our school, together with umpteen others in West Cumbria, organised a school trip via steam train to Largs. There we all boarded a steamer which took us up the Clyde to Glasgow. At that time it was an impressive sight and sound, with the banks of the Clyde bustling with activity at the many shipyards. Alas, a bygone era. On our final night at Largs, we retired to the marina bar where Rex and I sampled what the bar tender offered as a fine malt whisky. It was exquisitely delicious; liquid smoke. Its name, Ardbeg. Try it! The following day we travelled by train to our respective homes, reminiscing on a thoroughly enjoyable voyage. 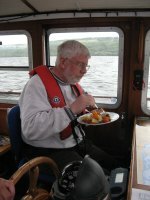 As mentioned earlier it was Alan's intention to solo sail after Largs. He took in the Isle of Man and then sailed on to Aberystwyth to meet up with an old friend of his. Sad to say, it was whilst he was there that he received a call from one of his major clients. Although he could handle most of the software issues remotely, the scope of the new problem necessitated him needing to work alongside the customer over an appreciable amount of time. He was therefore faced with the prospect of leaving Kiitaja moored in Aberystwyth marina, or urgently getting it back to Tollesbury. This would involve continuous sailing, and he needed crew to aid him. Since I wasn't tied to work commitments, he called me to see if I was available. I replied in the affirmative and the following morning I made my way across country; a tortuous route via Norwich since signaling cable thieves had disrupted the trains travelling due west of Ipswich. No sooner had I arrived in Aberystwyth when we set off on the voyage back round the south coast. Alan warned me that the seas outside the harbour would be rough. He wasn't joking; I was on the foredeck tidying the ropes away when a wave broke over the bow and soaked me. We made slow progress down Cardigan Bay and Kiitaja was taking a real pounding, so much so that we decided to seek shelter in Fishguard Bay in the early hours. The following day we stayed at anchor in appalling weather, with only a circling lifeboat on practice drill to keep us company. Still, it gave Alan a chance to hammer out some more software. Pressing time constraints urged us to venture out the following bright morning. 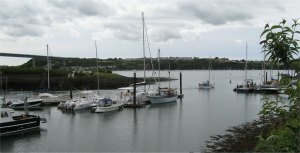 The seas weren't any better, and after a rough crossing over St Brides Bay, we sought a bolt hole at Neyland on the eastern end of Milford Haven. The whiff of oil fumes by the refineries suggested that one spark could send the whole lot up in smoke. Neyland offered the chance of a welcome shower, and we tucked into a hearty meal accompanied by a beer or two that evening at the club house. 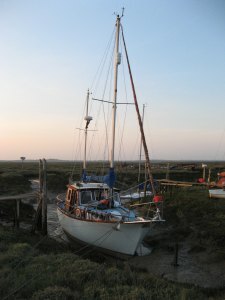 The manageress of the club recounted how this quiet marina had once been the scene of considerable commercial activity, and pointed out the manmade inlet on the opposite bank where ice was once loaded onto barges. The following morning I noticed that the boat berthed next to us in the marina was being serviced by an engineer. The owner eventually turned up and we got chatting. It transpired that he was waiting for his son to turn up, and together they were going to sail the boat back to their home port in New Zealand! Full of admiration for those guys. After Alan managed to purchase some spare fanbelts (Kiitaja was getting through them at a regular rate) we set off for Land's End; a bright day with choppy seas. In the Bristol Channel we had the brief company of a few porpoises for a while. Later, a distant glimpse of Lundy broke the monotony of the empty expanse of grey sea. A day later we had reached Land's End; the first time I'd ever seen Land's End. As we kept a respectable distance Atlantic side of the Longships Lighthouse, it struck me that this was a momentous occasion, almost bringing a tear to the eye if it hadn't been for the incessant lurching of the boat. We were receiving a grand pummeling from the Atlantic. Bringing Kiitaja round to head across Mount's Bay towards the Lizard Point, we encountered very confused seas superimposed upon big rollers coming in from perhaps a hundred miles away in the Atlantic. This had a drastic effect on my wellbeing, and I was quite ill as we struggled across the bay. 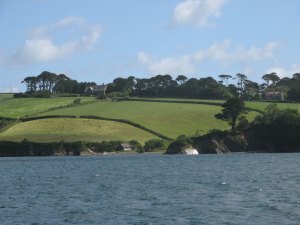 Prospects looked grim, so Alan decided to seek shelter up towards Falmouth, and we eventually bolted into the Helford river during darkness and dropped anchor for the night. Anchorage in the Helford River The weather forecast for the following day was more grey foulness, but we awoke to a surprisingly bright morning in a gorgeous location on the river, and enjoyed a hearty breakfast in these hospitable surroundings. Compared to the incessant lurching al the way down from Milford Haven, this was heaven. We suspected that the relative calm of the river would transform into more troubled waters once we reached the sea, and pondered about whether we should risk it. However, time was pressing on, and it seemed such a lovely day, so we took our chances. We found the open sea fairly choppy but manageable, and decided to head homewards sailing round the clock, weather permitting. 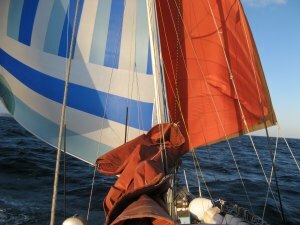 Whilst we were crossing Lyme Bay with the wind directly behind us, Alan decided to put both the genoa and cruising chute sails up front; a spinnaker would have been a bit of a handful. With the strength of the wind and both these sails inflated, we were sailing along at a fair lick averaging about 11 knots, which is fairly quick for Kiitaja. However, with choppy seas hitting us from the stern, the back end of the boat was being kicked about enough to cause one of the sails to collapse every so often. It was how I imagine riding a bucking bronco to be. Alan was having a hard time trying to keep course so that the sails were both inflated, but he was really enjoying it; perhaps he has masochistic tendencies. It also meant that we couldn't track the exact course that we wanted, but hey, we were fairly shifting in the right general direction. We sailed like this for quite a few hours. It was during this spell that we heard a call come through the VHF radio on channel 16 from the coastguard regarding a yacht in difficulty in the vicinity. From the positional information given we knew it couldn't be us, besides, we knew we were not experiencing any real difficulty. However, scanning the seas around us, we appeared to be the only ones mad enough to be out in these conditions. Five minutes later, the same call came over the airwaves. Still, there were no other vessels out on the seas, so Alan courteously responded to the call advising that we couldn't see any vessels out here. After a brief conversation, it transpired that we were the vessel that they were referring to. An eagle-eyed coastal watch observer had spotted us through his binoculars, and seeing that one of our sails was periodically collapsing, thought that we were in difficulties, and decided to report the sighting to the coastguard. Of course, he had had to estimate our position, hence the inaccuracy in the positioning information. Alan explained we were not experiencing any problems, indeed his words were, "We are having great fun", and expressed our appreciation for their concern. They were happy to run with that and just requested that we report in to our local coastguard once we reached our final destination. It brought a warm feeling to the heart to know that there are unknown souls out there who care and have the welfare and best interests of strangers at heart; restores one's faith in humanity. A day later we passed south of the Isle of Wight, and I took over the night watch as we approached Brighton. Being a two man crew, we had slipped into a 4 hours on, 4 hours off existence, occasionally sharing meals together, but usually trying to catch up on sleep. Unfortunately Alan had a background problem of still running a business whilst at sea too. I don't know why, but this was a particularly solitary watch, and to relieve the boredom, I was familiarising myself with all the shipping forecast sea areas. Sad, I know. On this particular leg of the journey, we were under motor power. Just as dawn was breaking, I was on a course to just round Beachy Head. A coaster was coming up behind me on our port side, probably from Newhaven, and was also heading to round Beachy Head. Since it appeared to be on a consistent bearing, but getting closer, I deduced it was on a collision course. I took the wise move of turning hard to port to come up behind the vessel, and then I could resume our original heading when the danger had past; a standard manoeuvre. I had slipped in behind the coaster, and was about to turn starboard to avoid Beachy Head looming up above us, when the engine died. The silence was so abrupt that it instantly woke Alan up. He immediately spotted the cliffs in front of us, and the fact that we were now drifting, and dropped anchor straight away; amazing really since he had been asleep only seconds earlier. We then rapidly pulled up the floor tiles to gain access to the engine, and after a while we ascertained that the fuel tank we had been using had run dry, even though the fuel gauge still indicated a decent amount of fuel remaining. We had a separate fuel tank that could be called upon, but first we had to purge the air out of the system. We were soon back under power. However the incident alarmed Alan since it appeared that the fuel gauges were not properly calibrated, and it transpired were also non-linear. The plan of action now was to call in to Dover, completely fill the fuel tanks, and try and calibrate them against the filling station gauges. This we duly did, and enjoyed a hearty meal there before being asked to move on since another boat was popping in for a refuel, 30,000 litres worth! Pass Between the Red and Green Buoys Please! We headed on up past Ramsgate and crossed the Thames Estuary, observing the Royal Sovereign Lighthouse on the way. As night fell Alan eventually got to put his head down, and I took over the long haul up to Tollesbury. By dawn we were entering the River Blackwater, but Alan was so whacked out, I just let him sleep. 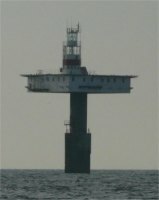 I navigated up to the Tollesbury South Channel, but had a last minute panic; all the channel marker buoys had disappeared and I did not have an intimate knowledge of the twistings of the channel. Not savouring the risk of running aground, I woke Alan up since he knew the channel inside out. We discovered the buoys tied together further up the channel; they were in the process of being replaced. We had a five hour wait until there was sufficient depth of water to reach Kiitaja's berth, so we tucked into breakfast and caught up with some well earned sleep. The journey, although pressurised due to time constraints, was the most challenging, enjoyable and rewarding sails I have had. The combination of long stints way out at sea, together with the canal sections and associated delightful countryside, not forgetting some charming ports of call, made for a trip of unparalleled variety. 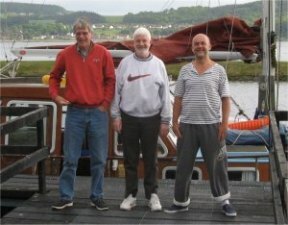 This was enhanced by the good company of Alan and Rex; two experienced sailors who I had complete confidence in, were good fun and always a pleasure to sail with. A truly memorable adventure!